It has been a week since I have added anything new and I feel compelled to update you on recent events regarding Cruising Photography & Eudaimonia. I’d like to say I have a great ride to tell you about or wonderful photographs to show you but I do not. This past week has been a quiet one for generating new material. My getting out and about has been curtailed and this has included going for rides. Despite my hunger for eudaimonic experiences, recent days simply have not fed this appetite for me. These quiet periods are inevitable, frustrating as they can be. My initial tendency is to sort out why is this happening but sometimes the rhythms of life are not conducive to eudaimonic bliss. Such has been this past week and I will not fret too much about it. Still I do want to keep you abreast of what is happening and there are some things to report. In the meantime, please bear with me until i can seek out and tell you about more eudaimonic experiences. Another article, the third now, appeared this week in Palmer Ranch Life, a local community magazine here in Sarasota, Florida. 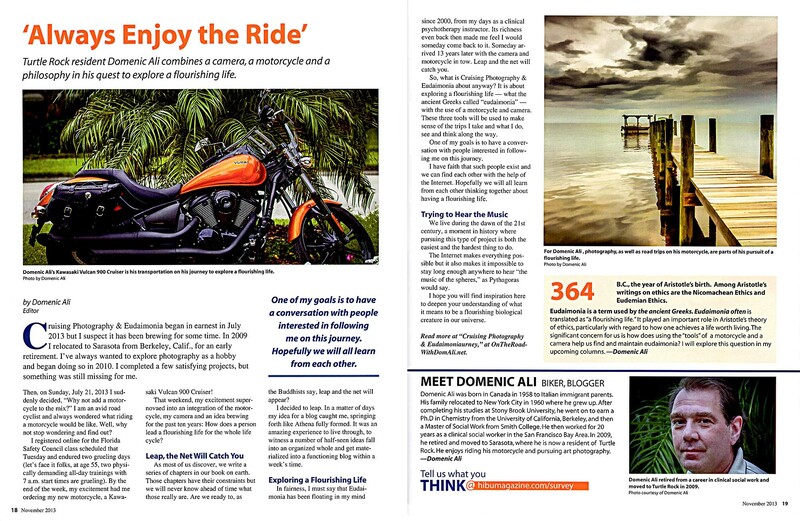 My article was given a generous two-page spread as well as an additional half-page showcasing some of my photographs. Of the three articles, this one was laid out in a manner that especially emphasized the role of philosophy in Cruising Photography & Eudaimonia. Seeing the article in print suddenly made it all real for me and I began to think more about what is the mission of this project? You can find my first pass at answering this question in Riding Your Cohort Into Eudaimonia, an essay I’ve added to the Eudaimonia section. Consider this not the last but rather the first pass at my articulating what is still an intuitive sense of where I am going with this. I hope to use this initial framing as a way to guide my plans for getting the word out about the project and will be sure to include my efforts and their outcomes here. I also began going to a motorcycle forum to share this project. The initial response has been encouraging: over 160 people read each of my first two posts (a reposting of the Do You Want To Face The Sun?, and the video An Eerie Trip). Alas only one comment was made so I do not know what people as a whole actually thought about what they read and saw (the one comment was about the video, saying it was a good start but more needs to be developed — I agree). I am finding explicit feedback is hard to come by and one must rely on simply whether people are coming at all. So far it does appear that people continue to come read the posts, so I will assume they remain interested in all this. And certainly getting the articles published is a big encouragement as well. Finally, I have noticed my relationship to the Ambient Movie idea is somewhat different from to the writings and photography. With the photography and writing I am more concerned with reaching an audience than with the video experiment. If the writing and the photographs do not touch you then I consider myself at not having communicated with you. I do want to create something of value to both myself and an audience, hence the conversation is critical: if my writing and photography fail “to reach you” then it is not doing what I want it to do. The video experiment, on the other hand, I find I feel less so and I think I may know why. I have spent enough time developing my writing and photography that it should be communicating something to others by now. If it were still solipsistic, that would be a problem for me. The video experiment is different. I do not exactly know what it is I am trying to do there. With the video, I am showing you my artist sketchbook so to speak, my idea-in-the-making with no claim about what if anything it will become. There is a vulnerability in this for sure, not to mention the danger of opening something up too soon. Nonetheless, allowing you to see this part of the process seems relevant here — the ideas we invent and what we try to do with them in our search for eudaimonia. I am reminded of my digital collage work. It took two years from my first attempt at a collage to something which I felt had developed to a point I was ready to show the work in a gallery. These video experiments are at that beginning stage and may or may not develop into something more substantial. For now, I am willing to occasionally post my experiments without too much concern for whether they make much sense to either of us. What I can tell you is that i already am seeing things I would have done differently, i.e. i already am seeing the idea evolve as a result of what has been done so far. Someone once said that success is not about “try and succeed” but rather “fail, fail, fail and finally succeed.” That pretty much covers learning to create art, too. And so this has been some of the past week. Not the most eudaimonic but certainly things are brewing under and around the surfaces. I hope to get out on the motorcycle this coming week and have new experiences to tell you about. After all, it all begins with the gesture, in the movement of life. Without that, there is nothing to explore, nothing to develop, and nothing worth conversing about. A big cat was watching a little cat chase its tale. The big cat said to the little cat “why are you chasing your tale?”. The little cat replied “my tale is happiness and when I catch it, I will truly be happy”. The big cat said “when I was a little cat, I used to chase my tale too. But I found, if I left it alone, it followed me wherever I went. Dom, be gentle with yourself and your artistic “Poeness” will be unleashed.